The next logical variation on this week’s theme is to see how this bread reacts to some additions. I fully understand I’m not blazing any new territory here; but it’s something I’ve never tried for myself before. Exciting! The simplest addition you can make to any bread is to add different grains and seeds to the dough, so that’s the route I’m taking today. This version remains a fairly light multigrain bread, mostly composed of white bread flour, but there’s a decent amount of whole wheat flour, with a handful of rye thrown in for complexity. For me, though, the interesting part comes from the other additions, which can be whatever combination of grains or seeds you like best, or happen to have lying around. Here, I’ve used a mixture of yellow millet, to pop between your teeth, hearty steel-cut oats (old-fashioned rolled oats would do just as well, but I prefer the more rustic texture of steel-cut), ground flaxseed for a nutty flavor throughout, and poppy seeds, with their sultry, dusky purple flavor. To add some tang, there’s a touch of plain yogurt in the dough, which, like the use of white vinegar, helps replicate the acidic notes of a real wild-yeast sourdough. Yogurt, being a dairy product, does help soften the crumb a little, though the effect here is slight. 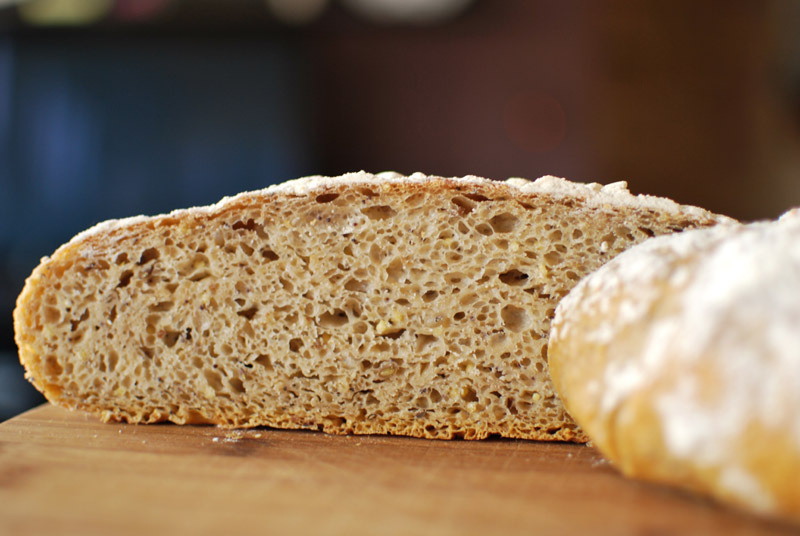 More noticeable is the quite welcome sour flavor it lends, which is lovely in conjunction with the hint of rye flour. The overall taste is nicely balanced between the pleasant coarseness of whole grains and the softness of a typical white bread, punctuated with the complementing flavors of poppy, flax, and oat. The crust is perhaps thinner than the original no-knead bread, but not greatly. A bite lands on your tongue with none of the dryness that plagues so many multigrain breads, leaving an almost creamy sweetness instead. Though it wasn’t the tallest riser, that’s to be expected from such heavy additions as grains and seeds; it absolutely had a more open crumb than many other multigrain breads I’ve made. Yes, this is one of the more successful no-knead variations I’ve yet seen, one that was well thought out in inception and actually follows through in execution. 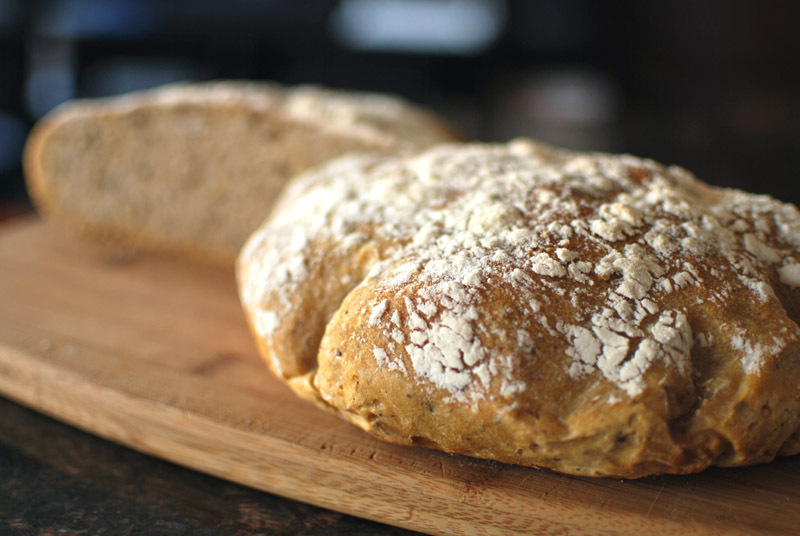 Here, the no-knead method really shines, not interfering with the potential success of well-proportioned ingredients (and vice-versa), doing just what the method is intended to do: create a great loaf of bread with the minimum possible effort. Thanks much to Breadtopia for the original recipe! 1. In a large bowl, whisk together the flours, flaxseed, millet, oats, poppy seeds, salt, and yeast. Add the water and yogurt, and stir until blended; the dough will be shaggy and sticky. Cover tightly with plastic wrap, and let dough sit at room temperature for at least 12 and up to 24 hours (but preferably about 18).